Pore Water Squeezers – Geotek Ltd.
Equipment now available to extract pore waters from sediment samples. The Geotek pore water squeezers are machined entirely from high grade titanium to ensure there is no contamination of the sediment pore waters. 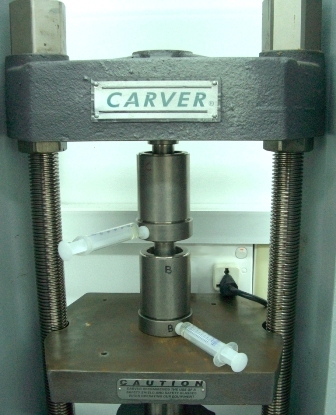 The cylinders house concentrically fitting pistons that are used to compress the sample. 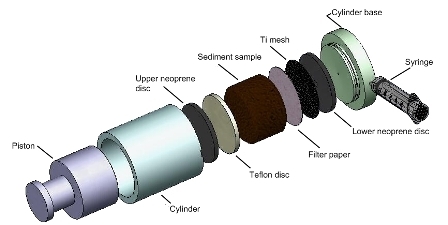 The sample is squeezed between a neoprene seal at the top and a filter paper lying on titanium gauze at the bottom with a Teflon disc to distribute the load evenly over the surface. The hole at the base of the unit directs the interstitial pore water through to the extraction port on the outside which has a tapered ‘luer’ shape to enable a simple press fit connection of a syringe. The cylinder and the base are sealed during the squeezing process using an o-ring. The squeezers can be completely disassembled for easy cleaning. The pistons have been designed with a large surface area to enable the use of a press for the squeezing process. This is essential when sampling from sediments with low porosity. Two sizes of squeezer are available accommodating sediment sample volumes of 83 and 604 cm³; other sizes can be machined to order.